These are just few examples. There are far too many stories like that. The key is how we approach a job application. How do you make your resume and how do you make your first contact. If you think a little hard it is nothing but how we present ourselves to the organization though our résumé and most importantly the covering letter for job application. In this write up, we will discuss about the covering letter. While it is always imperative to write a good résumé, but writing a good covering letter is essential. 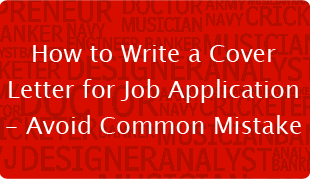 To write a good covering letter we need to avoid certain mistake. Let’s discuss some of them. There are many reasons why we wish to go for a particular job, wish to join a particular company or organization to learn certain skill which would help us to grow, thus have a self purpose. But does that mean we need to mention it in the cover letter also? The employer is interested in finding a person who can fill a need or solve a problem. So the first step for writing a good covering letter is that it should explain why you're that person who can fill a need in the company or solve a problem. At this stage, it's all about what you can do for them, not what they can do for you. You can always have discussion about your aspirations and career goals after you join that company. The second mistake many people do is showing their desperation to get a job. Many people write, “I am looking for any paying position freelance, part-time or full-time”, meaning any position which is available, adjust me. While writing these words we may think we are showing flexibility or making prospective employer feel special. But in reality being open to anything can close a lot of doors. You may be desperate, but don't tell them that. The best thing would be researching a bit about the company and add a line about why you want to work for this particular company. You may also speak about the culture of company and how you are motivated to work with the kind of people the company is comprised of. Thirdly, avoid talking about irrelevant stuff. Many a times people mention irrelevant things like, “I stay near the office”, or, “I am free from house hold responsibilities”, or, “my children work nearby”, or, “I belong to some group or community” etc. In your covering letter ONLY mention why you are most suited for the job and company. Anything else is not really that essential. Fourthly, lots of prospective employees write a very short covering letter, as if there are out of words or do not have adequate space to write few lines about themselves. Statements like, “please see my résumé attached”, or, “I look forward to speaking with you” etc are not sufficient. Just writing polite words like “please” or “kindly” will not compel any one to open your attachment. Your cover letter should be so interesting that nobody should be able to resist reading it. Make sure to add a few lines about yourself and why you're a good fit for the job. Fifthly, on the flip side of writing a short cover letter is writing a very long cover letter. You may have accumulated many years of experience and wish to talk about them. But nobody likes to read a very long letter. You need to limit your cover letter to three to five concise paragraphs, and maybe throw in some bullet points to further break up the text. Do not ever beef up. Transparency and brevity does not mean you need to show off to the people you do not even know. Sometimes it may act as boomerang as people may interpret it differently based on their experience and value system. And lastly, read the covering letter twice, or rather thrice, proof read it, check for spelling and grammatical mistakes. Do not write anything which would show your casual behaviur. Write those things which are relevant and the apt job would knock at your door.